For John Buckley of Quarter Circle X Ranch, just outside of Cochrane Alberta, finding their “True North,” means having the highest, most productive and efficient cow on their pastures. And it’s a tall order. She has to be able to withstand all the curve balls that Mother Nature can throw at her on the Rocky Mountain landscape, and be able to do so with very little supplementation. In this relentless pursuit of high performance in his cowherd, John relies on the data that Beefbooster provides, and for him, the “aha” moments are happening every day. “I am aiming for a high level of production and efficiency. Through the data provided to us through Beefbooster, we are getting more and more accurate on our predictions. I know where I am at and where I want to continually improve,” says John. Specifically, he says the data is a critical tool when it comes to making selection in their replacement heifers, saving him time and improving herd efficiencies and predictability. “We are in the process of making replacement selections so that used to be an enormous task and it would take us a couple of days to get it completed – mostly on foot. Now it is done on the computer screen, with more reliability and predictability,” says John. Not only does the Beefbooster data save him time and footsteps, it elevates their business of cattle production. Where weight and appearance used to be the selection factors for their ranch years ago, now with the data provided by the Beefbooster system, high performance animals are easy to identify and select. “Data is my production tool; through its use, we have evolved to where we are today – where I am almost ready to sell our replacement heifers at weaning, because our accuracy level is that high,” he says. Every cattle operation is individualized, with its own needs and risk factors – and these differences can happen just across the fence. That is why Beefbooster strives to provide one of the only data collection and analysis programs that can help you assess multiple factors that affect your herd’s success. The Beefbooster advantage is looking at the whole picture – not being distracted by one or two traits. For commercial cattlemen like John, it becomes economically relevant to predict what the trait does. “The data makes my picture clearer. It keeps me pointed in the right direction for continual improvements and advancements on my operation. It is my compass for my True North,” says John. “We currently weigh each and every calf at birth electronically and that data has opened up a whole new world for us. Our scale is positioned on our quad (ATV). The system keeps the calves at a height that allows me to keep my head up and watch the mother cow. We catch the calves and place them in a buggy on the back of the quad; that way the calf is immobilized and his mom sees him. Although we didn’t invent it – other cattlemen from Beefbooster did – we adapted it and modified it for our operation. I guess you could say that we are on version 5.0. The things I need to and want to accomplish demand improvements. I am now faster than I ever was on my horse and we are calving out 700 head every year. It’s a really great tool. As I see it, you are out there anyway tagging at birth. We have always weighed our heifers in February, so we knew that we would get a level of performance from a yearling weight, then our replacement selection was merely through eyeball selection. 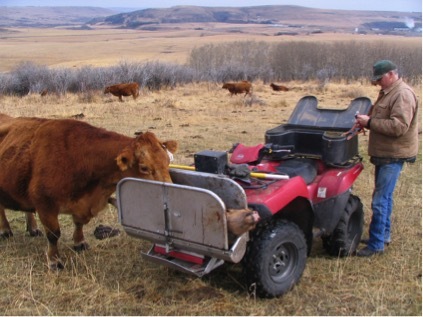 The calf catcher John equipped to the front of his ATV allows safe tagging and a calm environment for both cow and calf, while also offering the ability to capture accurate birthweights of each and every calf on his ranch. Another “tool in the toolbox,” he says that is making advancements on his operation. 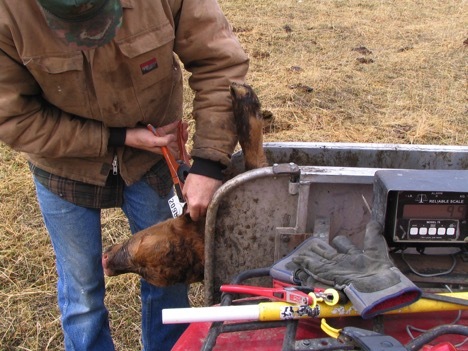 Beefbooster breeder John Buckley of Quarter Circle X Ranch, tags a newborn calf on the front of his ATV that is equipped with a scale that helps him gather accurate birthweights on every calf.